If you've read many of my posts on The Muffin, you know that I spend three hours a day teaching Journalism, Speech and Drama. So, when the last school bell rings in May, I create my summer to-do list and break it into multiple categories, like home improvements, school projects (you see, school NEVER ends for a teacher), and writing projects. This summer, my writing project list included 11 projects ranging from setting up a new schedule for my blog, querying new markets, completing some photo projects, devoting a specific number of hours to working on the novel, and developing story ideas for the regional publications I write for. How many projects were crossed off the list? Can I plead the 5th? Do I have to answer the questions? Yes, the deuce. Dos. One + one equals two. The weird thing is, I feel like I got a lot of writing accomplished this summer. I know my bank account appreciated my efforts! I'm frustrated that I didn't get more done. I've always thought I'm a good organizer and a fast writer. It got me thinking about WHY I didn't get a lot done. Interference from Facebook, Twitter and Words with Friends? Caring for the grandsons while their mom is at work? Wanting a bit of ME time? Too much "Orange is the New Black" or "The Newsroom"? Sure, some of those factor in, but they aren't the real culprit. So the day before I returned to school, I sent a HARO query and received a lot of great advice. During September, on my blog dates, I'm going to talk about tackling the to-do list and keeping it manageable. I'll be sharing information from organization experts, a psychologist, and medical experts. You may be surprised at some of the answers. I was! Until my next blog post, I'm curious. 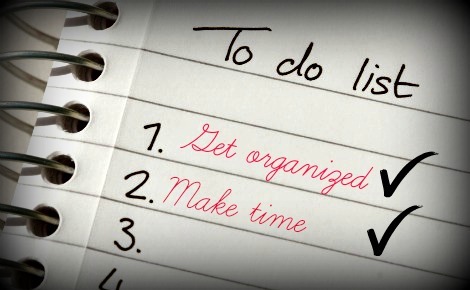 How do you handle your to-do list? Do you break down each task step-by-step? Do you have an established writing routine that lets you meet your goals? First, I am SUPER excited that you are going to tackle this subject and with these experts. I can't wait. My to-do list is a monster, every day. I never feel like I can just relax--I have stopped watching all TV shows. I do read a lot--but if I choose to read something that isn't for my book review column and only for my personal blog, I even feel guilty. A psychologist could be helpful to me! :) LOL As for approaching my list, I do have 3 columns: writing work with deadlines, stuff I would like to accomplish as a writer (like fix my blog, send brochures to schools), and then personal stuff--this includes cleaning, photo organizing, researching trips, etc. I try to organize my day by thinking about it in time increments: i will spend this much time with my family, this much time with work, and this much time doing the cleaning/organizing. This topic is near and dear to my heart. THANK YOU! As to what does help, I find that I have to actually schedule in tasks in my daily/weekly planner. That's how things happen! P.S. Orange is the New Black & Newsroom are shows I watch too. My husband and I watch about 5 different shows together, all Tivo'ed, so we'll watch them on a couple of weekend nights without taking up much other productive time. Some TV is ok! LuAnn--I'm afraid to watch OITNB because I'm almost at the end of "Breaking Bad" (one of a couple of monkeys on my back) and cannot handle another "addiction." I (unfortunately) consider my to-do list quite elastic. The deadlines (when it comes to my WIP and household chores) keep getting extensions. The Chicken Soup and other anthology deadlines get honored (because I have no choice). I am no help. Sorry. But I do NEED help, so I'm looking forward to your next post. I never do all I plan to do over the summer, but I have loaded 104 projects on Teachers Pay Teachers, and now I'm starting to make a little bit of pocket change. I found that I got the most done when I was in grad school because I always had very specific deadlines for when projects needed to be completed, so now that I'm out of school, I impose these deadlines on myself. This, along with list making, outlining and writing every morning when my daughter is in preschool, help me to get everything finished.